Dr. Paul M. Friedman, a board-certified dermatologist in Houston and New York, is considered one of the leaders in his field. Dr. Friedman recently decided to do a top-down redesign of his expansive website to provide viewers with a modern and sleek look inside his practice and the many advanced treatments available. The team at Rosemont Media helped Dr. Friedman completely revamp his previous website, designing a new version that has inviting colors, an abundance of content, and beautiful gallery images on full display. We strove to fulfill Dr. Friedman’s goal of developing a very informative website that accurately represents what patients can expect. In fact, all of the images on the site were carefully chosen to feature the skin conditions that Dr. Friedman and his team often see at the practice, and the large before-and-after photo gallery can give viewers a clear idea of the potential results that specific treatments can provide. The responsive website also includes utilization of the latest medical SEO strategies, a fixed navigation bar to allow easy access to the dozens of pages describing common skin conditions and available treatments, prominent social media buttons, an updated blog, and extensive details about the doctors and the practice itself—including a virtual tour. In addition, there are two custom landing pages highlighting information on birthmarks and scars that feature their own unique design inside this very unique website. 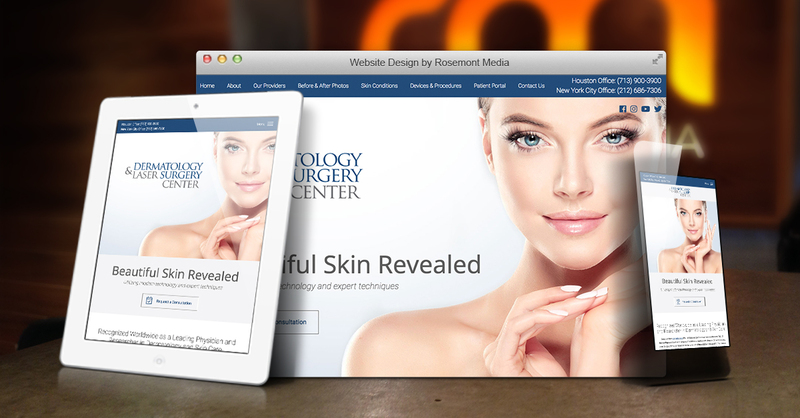 Head over to dermlasersurgery.com to have a closer look, and contact Rosemont Media today for more information on how you can give your website a customized makeover that can help your practice stand out from the rest!